There have been several point-and-click style adventure games that have hit the DS to date, including titles like Hotel Dusk, Time Hollow and the Phoenix Wright: Ace Attorney series of games. Likewise, there have been several collections of brain teasers or similar mentally challenging activities, from Nintendo’s own Brain Age and Big Brain Academy to My Word Coach and so on. However, there has only been one game to date that dared to merge the two genres, and in true Reese’s Peanut Butter Cup fashion, found that these two great tastes taste great together. 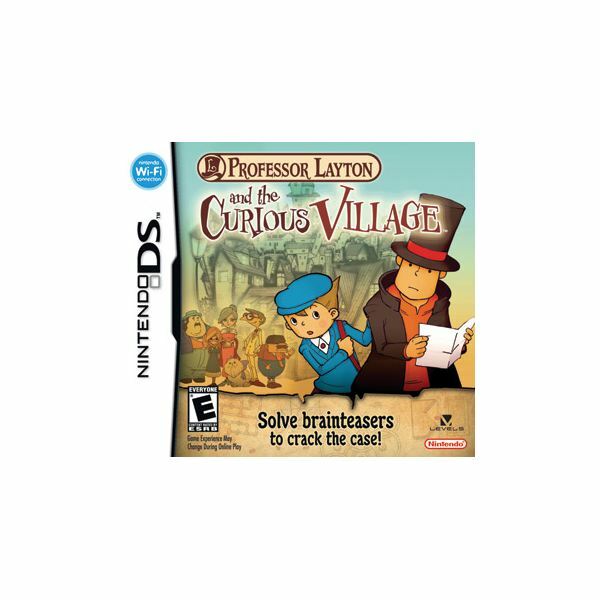 That game is Professor Layton and the Curious Village, which was developed by Level 5, and it is hands down one of the best reasons to own a Nintendo DS. The titular Professor Layton is a bit of a Sherlock Holmes type who is very good and solving mysteries and piecing together riddles. His fame caught the ear of a widow in the town of St. Mystere, who has asked the good professor to travel to the village and help solve a riddle left behind by her late husband, a baron. Whoever finds the Golden Apple inherits the baron’s fortune. Intrigued by the case, Layton and his young assistant Luke are en route to St. Mystere as the game opens. They arrive shortly thereafter and set about investigating. Along the way, they will find other mysteries amongst the townspeople that need to be solved and will come face-to-face with many dangers, as there are some who would rather off Luke and Layton and keep the treasures for themselves. Like many other adventure games, Professor Layton requires players to talk with the townspeople and to investigate the scenery to find hidden objects. However, unlike similar titles in the genre, the main focus is on solving classic brainteasers via the stylus and the touch screen. In fact, that probably takes up about 85% to 90% of the playtime. There are more than 100 puzzles in the game, and each time the player comes across one (either from a citizen of St. Mystere or by finding a hidden one’s location), he or she is given unlimited time to try to figure out the solution. Hint coins are also available, and completing some puzzles can lead to various rewards, such as furniture to decorate Luke and Layton’s rooms with or parts to some unknown contraption. Some of these challenges are logic puzzles, some are mathematical equations, and others involve manipulating objects in spatial brainteasers. If you enjoy this sort of thing as much as I do, you’ll absolutely love Professor Layton, especially since there are additional puzzles that can be unlocked after completing the game and still more than can be downloaded via Nintendo Wi-Fi Connection. The production values of this game are incredible as well. There is a lot of voice work involved, and all of it is exceptional. Luke and Layton’s voices in particular are spot-on, and I appreciate the fact that they were given British accents. It seems to fit their characters well. Likewise, the music is phenomenal, with the professor’s theme being among my favorite pieces. A music player can be unlocked through the course of the game, and I for one was quite thankful, as it is a real treat sometimes to just sit down and fire up the soundtrack. The character designs are unique and highly artistic, and the cut scenes that play throughout the game are as well illustrated as any television cartoon you’ll see. Overall, the stylized look of the game, as well as the way the voice acting and the music help establish the mood and atmosphere, make these categories two of the true highlights of the Professor Layton game. Some adventure fans have expressed disappointment that the game focuses less on elements of those kinds of games and too much on the mental challenge of the brainteasers, and if you’re looking for something exactly like Phoenix Wright or closer in scope to Hotel Dusk, there is a chance you will come away disappointed with Professor Layton. Everyone else, however, will most likely enjoy the way the game deftly combines its logic puzzles with an overarching storyline, the outstanding production values both in terms of audio and visual quality, and the charming story. As I mentioned above, this is one of the best reasons to own a DS. It is a unique blend of two drastically different game genres that works better than I could’ve ever imagined. If you don’t already own Professor Layton and the Curious Village, then as you play it and experience its sheer brilliance, join me in hoping and praying that the sequels that round out this trilogy will eventually find their way over to the United States.